Big data and data science are fast becoming the lifeblood of IT. All the in-demand skills, like hadoop, machine learning and business analytics— for analyzing vast volumes of data are expanding at a rapid pace; thus, making data science careers one of the most sought after options of the technology world. 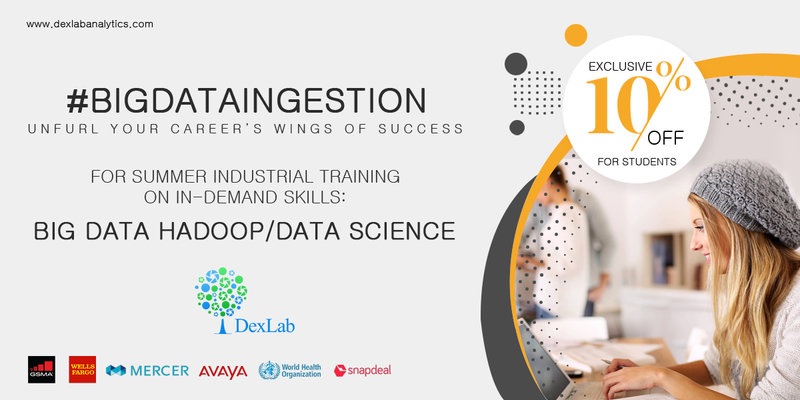 DexLab Analytics aims to promote Hadoop, Data Science, Machine Learning and Business Analytics careers amongst students, which is why we are offering Summer Industrial Training on Big Data Hadoop / Data Science with exclusive 10% DISCOUNT OFFER for students. While, the Hadoop and Data Science module is targeted towards B. Tech and B.E students, the Data Science and Business Analytics is for Eco, Statistics and Mathematics students. The campaign is solely focused on Hadoop, Data Science & Machine Learning and Business Analytics certification training. The training includes industry relevant training, case studies, hands-on training, study material, practice sets, assignments, etc. Start enrolling today.